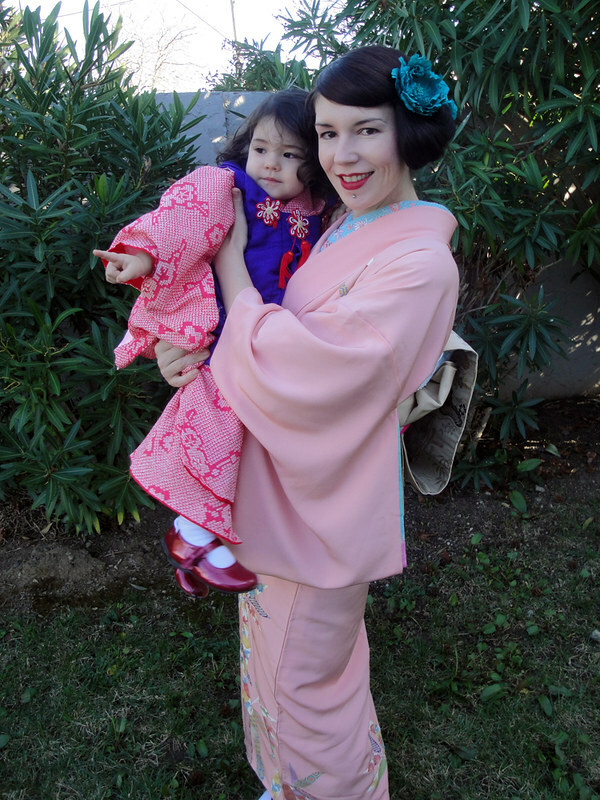 Yesterday (3rd of March), girls all over Japan celebrated Hinamatsuri, alternatively known as Girl’s Day. 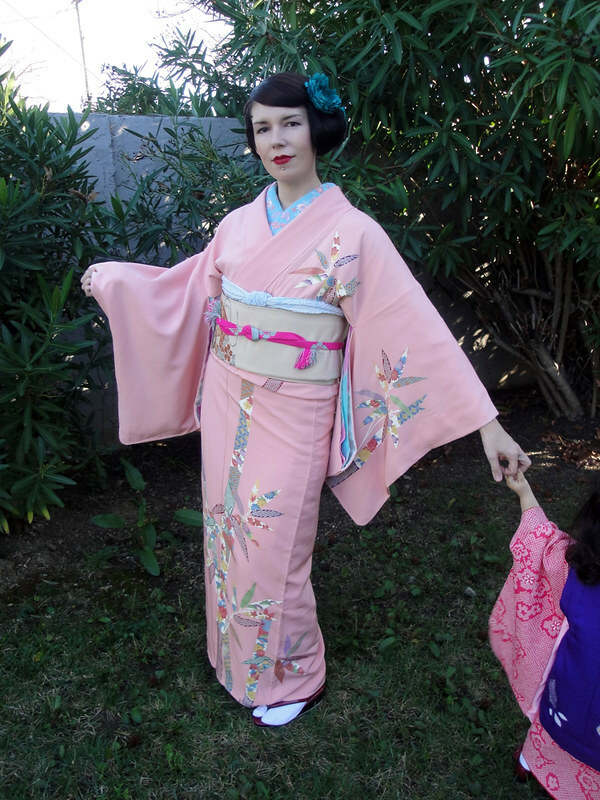 We don’t have a Hinamatsuri display yet, but I thought it would be fun to dress Lily and myself in kimono to celebrate! Being “Girl’s Day” and early Spring, I thought rather than my usual bold combinations, soft, pastel colours would be whimsical and feminine, and also the most appropriate. 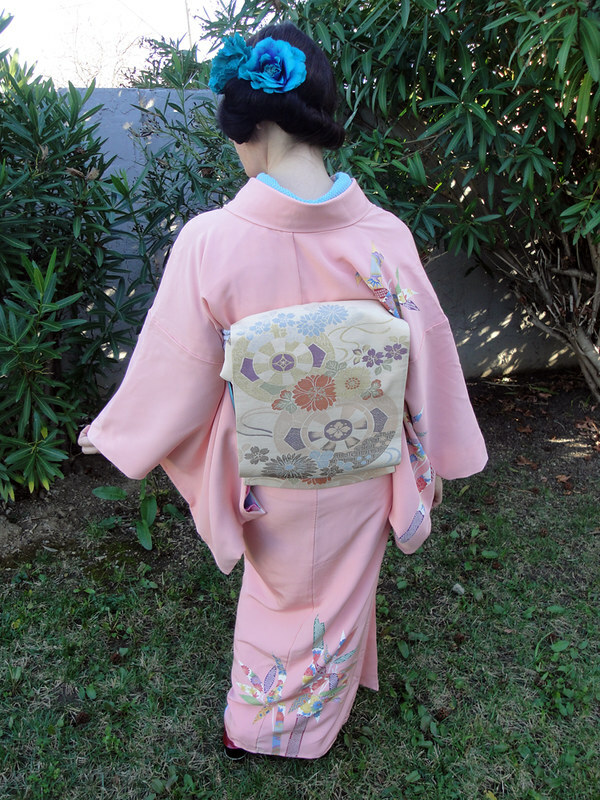 For my ensemble, I chose my salmon pink bamboo houmongi, while a modern piece, has a very vintage Taishō / Early Showa design, my “robin’s egg”” blue and pink shibori juban, and my Taishō chūya hikinuki obi with Genji guruma (Heian cart wheels). I felt Genji guruma was a subtle motif nod to Hinamatsuri without wearing something with the Emperor or Empress on it. 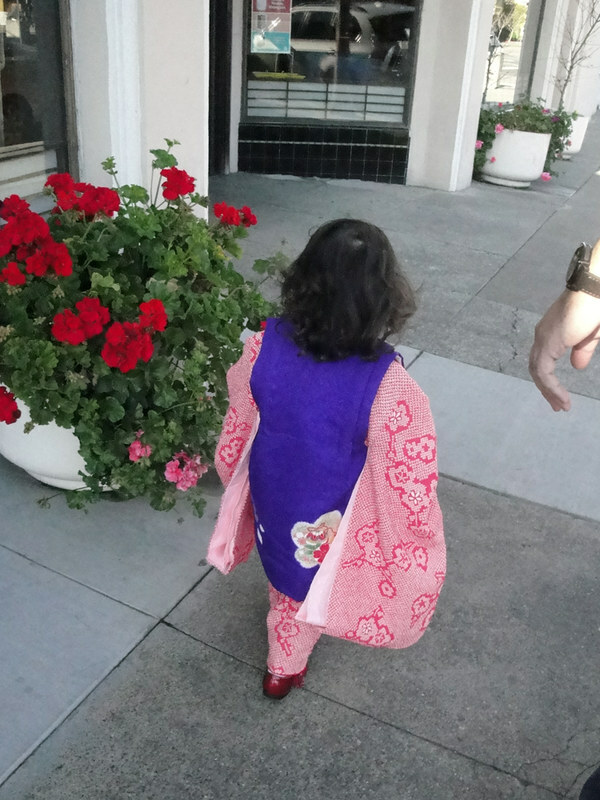 For Lily, being the cheeky imp she is these days, I decided to dress her in one of her washable furisode sets. 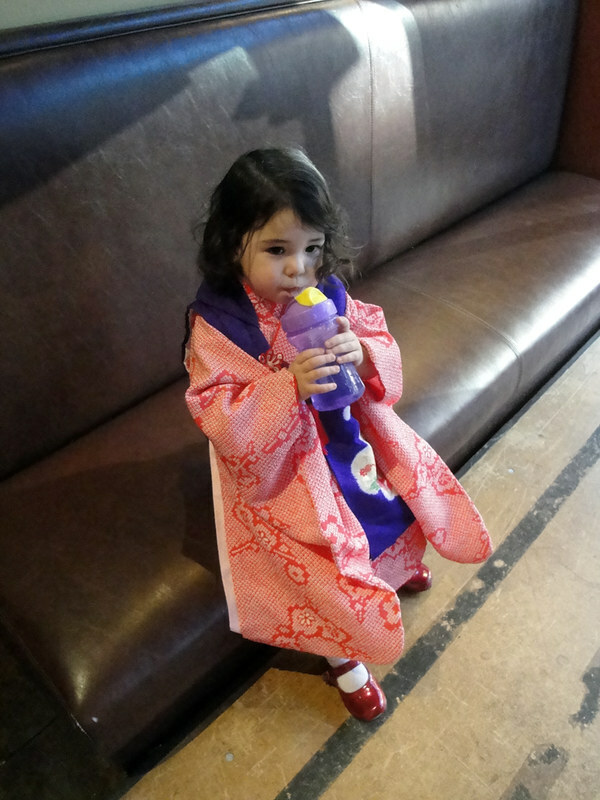 Lily really loves wearing kimono (yay!) and was telling me she wanted to wear an obi, obiage and obijime as well, however today, she decided she wasn’t interested in being photographed – so it was extremely difficult to get a remotely decent picture of her dressed up. She also decided that after putting a bow in her hair, she DIDN’T want to wear it after all. Ahhh, two year olds! And my favourite photo of the day – it took for us to pin Lily down in the car seat to keep her still enough for that great big smile of hers! 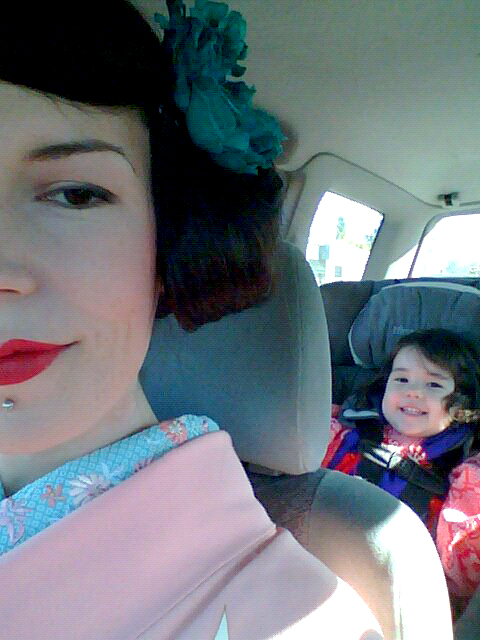 But, of course, we were off to get some manju, which is completely deserving of a smile! 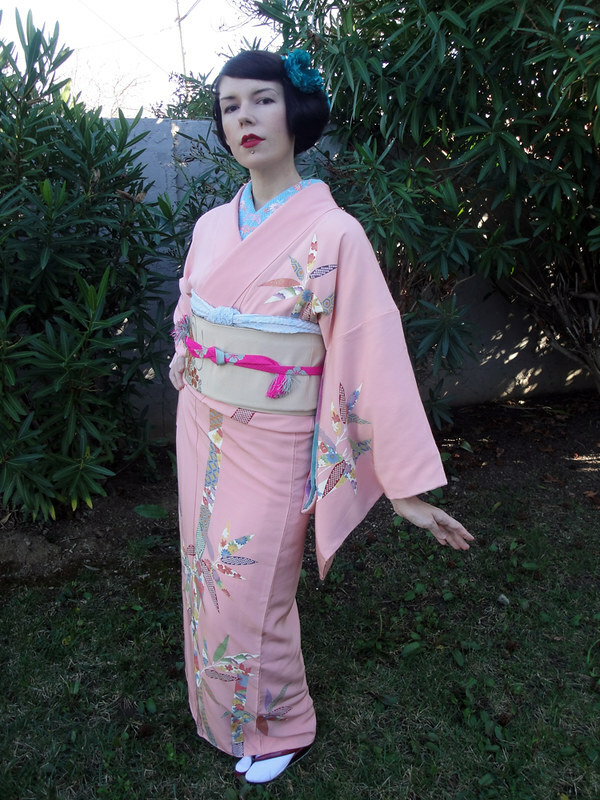 Kimono Challenge #3 - Your most used kimono item(s) not counting jubans, datejimes etc).